Usually, Saturdays are cooking days in my house while I get ready for my blog dates with Merideth. In the heat of the summer, this is way less exciting. I just got back from a week in California and, now that I’m home in, realized I never truly appreciated how absolutely hot it is in Florida. This minimal-cooking, refrigerator friendly recipe is perfect for lazy, hot summer afternoons when you want to make the most of your air conditioning and chilled white wine. 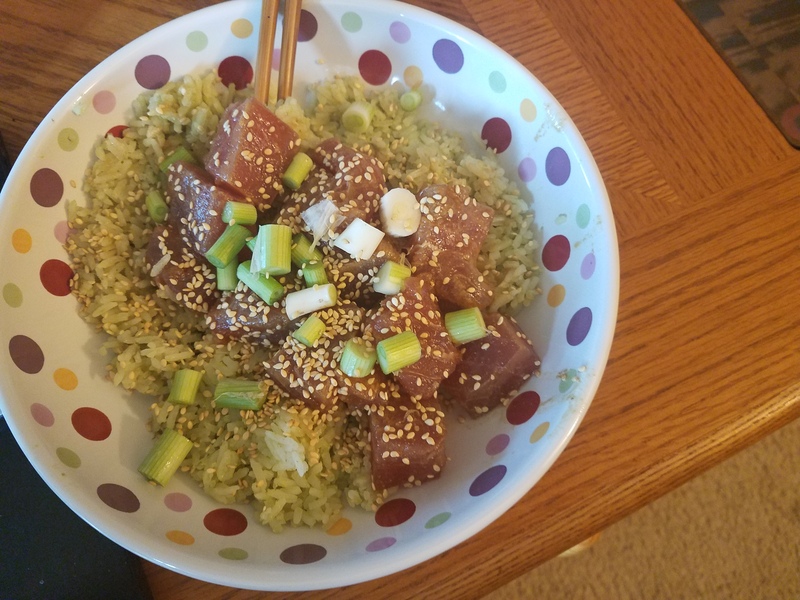 Whisk marinade ingredients together and pour over tuna in a bowl and Marinade for at least 15 minutes. Stir diced avocado into jasmine rice until smooth. Season with salt, pepper, and ginger. Top rice with marinated tuna and other accompaniments as desired. Wine Pairing: Though I’m tempted to justify a Pinot noir because I tend toward red wine, this tuna was great with a Pinot Grigio, which is slightly sweeter than a Sauvignon Blanc without being too rich.